I have been fascinated The Northern Lights have me ever since I have known about them. It’s hard to imagine seeing the night sky alight with streaks of colour dancing like some amazing freak-of-nature induced acid trip. Like many others-this has featured high on my bucket list for a long time. This desire was reignited again recently by the beautiful description that a close family friend explained gave of the phenomena to her son when she described them as ‘a glorious visual feast‘ and ‘a concert in the sky‘. These descriptions lit a burning desire inside me to bear witness to it. Aurora over Earth, taken from the International Space Station. The incredible temperatures and energies of the Sun ionise matter, and send charged particles hurtling through space towards us at thousands of kilometers per second. Earth’s magnetic field bends these charged particles, meaning that, for the most part, our planet deflects this harmful solar radiation safely away from Earth… Except, that is, near the North and South magnetic poles, where those field lines all appear to enter/exit our planet. And whenever the Sun emits a solar flare or sends packets of radiation hurtling towards us, Earth’s magnetic poles act as funnels, pulling the charged particles into the upper atmosphere in a ring around the magnetic poles! As these particles enter the atmosphere, they’re energetic enough that they knock electrons off of their atoms in the atmosphere, causing the light shows. Why are some displays just Green, but others are multicoloured? As the electrons enter the earth’s upper atmosphere, they will encounter atoms of oxygen and nitrogen at altitudes from 20 to 200 miles above the earth’s surface. 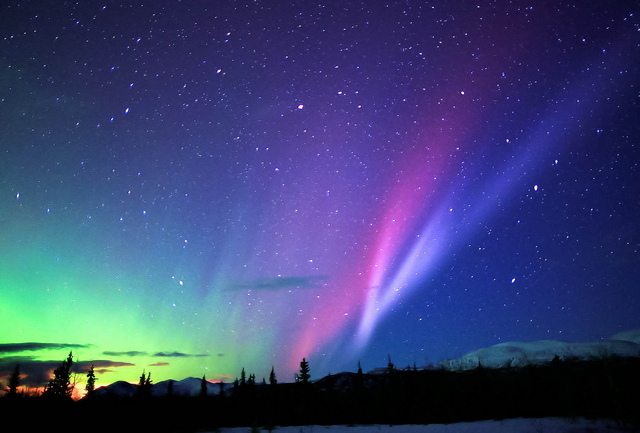 The color of the aurora depends on which atom is struck, and the altitude of the meeting. I researched at great length where the best places to view the Northern Lights are… Not all places that sell Northern Lights trips are equally good for seeing them. 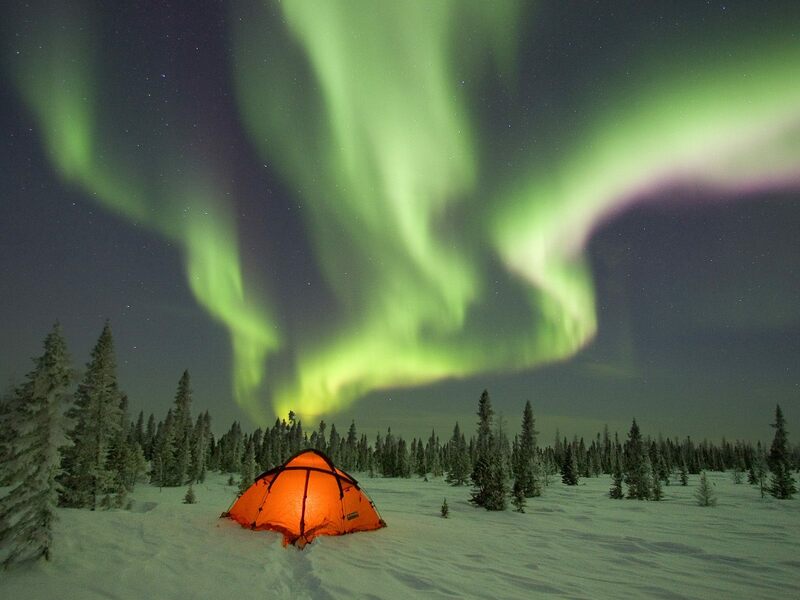 For most people, a Northern Lights trip is a once in a lifetime type of trip, not least because it is hugely expensive! I know so many people who have been on trips to see the Northern Lights, but have come home disappointed (myself included). However, with a little bit of research, you can maximise your chances of observing them… Location Location Location So why did I choose Sweden? Clear Skies – Clouds will block a display from view, even if it is present above them. Low Light Pollution – Lights from a town, or even a full moon will diminish your chances to witness this phenomenon. Be at a very Northerly Latitude (ideally above the Arctic Circle) – This is where the most activity is visible. High Solar Activity – Without solar wind, there are no lights. Solar activity generally runs in 11-12 year cycles. 2012-2013 was meant to be the peak of that cycle, so the next 2 winter seasons will also be good statistically. Temperature/Weather: I decided against going transatlantic to see them in Canada or Alaska for several reasons. Time to travel there and jet lag, I wanted to see them in a Scandinavian/Nordic environment and also Canada and Alaska are vastly colder at the same latitudes than Scandinavia (because the warm gulf stream (North Atlantic Drift) passes to the East of Greenland and heads East to Norway delivering some of its heat to Norway. Greenland however gets the freezing westerly winds blowing straight from the Arctic circle) making Scandinavia the less harsh environment prom a practical stand point! I also chose March because this was the time of the mildest weather, which would give us the best chances for clear skies. Latitude: I ruled out Iceland because although it’s possible to witness them there, it isn’t actually in The Arctic Circle, and a lot of the trips sold there are near to large cities with lots of light pollution meaning that you only have small windows to view it during special excursions during the trip. I ruled out a Northern Lights Cruise, because whilst this would undoubtedly offer some of the best conditions to see the lights in, we also wanted to photograph the lights. It is difficult to photograph the aurora without a decent SLR camera and a tripod, as you need to expose the image for a considerable length of time in order to get the best image. Even an amateur photographer knows that slight camera shake would reduce the quality of any pictures, making them blurry-so bobbing about at sea was not going to be ideal. The 2 places that seemed to offer the best options as far as I could tell were Tromso in Norway and Abisko in Sweden… Both of these places have Northern Lights observatory stations which are specially dedicated to aurora viewing. In the end, we opted for Sweden because of it’s proximity to The ICEHOTEL, the World’s first, and largest ice hotel which was another item on My Bucket List. According to the scientists at IRF in Kiruna you have about an 80% of seeing the auroras (near Abisko) if you stay in the area for at least 3 days. I wanted to maximise the opportunities to see the lights, so this was pretty compelling for me… We also decided to do it fairly promptly as this year was meant to be the peak of the solar/aurora activity. One thing I think is particularly good about the Abisko Sky station, is their Live Website Camera Feed. You can watch this at any time to see what is happening there. We often watched it from the hotel bar, when we became too cold to stand out in the cold night air in anticipation of the lights, and would duck out if they started to appear on the screen. My partner’s parent’s stayed at a great hotel in Norway that also had an ‘Aurora Warning System’ in place, where all guests were allocated a beeper that would go off when the aurora was visible so that guests didn’t have to sit in the freezing cold all night in vain hope of seeing them. I think this is a fantastic idea-and I can’t understand why more hotels in the region haven’t cottoned onto this idea yet! Unfortunately, the solar activity wasn’t massive when we went. As such, we weren’t treated to the type of display that lights up the night sky so brilliantly that even the people with naff camera phones able to snap a picture of it… Typically – Just a week before we visited, the display was so bright that the night sky was lit up as bright as if it were day time! Whilst we didn’t see a dazzling display like this, the elusive Northern Lights did thankfully put in an appearance for us though. When we first saw the aurora; I wasn’t sure if we were looking at the Northern Lights or not. It looked like a hazy green(ish) wispy looking smoke trail across the sky. The image that it conjured was less ‘WOW’ and reminded me more of pollution to be honest. It was a little disappointing. Especially since everyone else there seemed to be really thrilled about it. We waited for the image to process with baited breath, and finally, the image popped up-there on the camera screen was the kind of image you see in the Northern Lights trip brochures! …An attention-grabbing, bright neon-green streak across the night sky! You could even make out faint red and yellow lights that are rarer to witness at higher altitudes. these had not been visible to the naked eye at all-but of course the camera was able to absorb far more light in 30 seconds than our own eyes can in real time, meaning that the images look very dramatic compared to what we were really able to observe without the aid of a lens. This was a mixed reaction for me… On the one side I felt ecstatic and privileged to have finally witnessed the aurora borealis. There was definitely a WOW feeling, but a little part of me felt like I did as a child when I opened the Christmas gift I had yearned for and dreamt about for months on end, only to learn that batteries were not included and I’d have to wait until after Christmas to be able to use the damn thing. Short sold. Part of me wondered if that’s all people ever saw, though we were assured by other people on the trip that this was not the case. It also makes me wonder just how those stunning images from all of the pictures really look to the naked human eye behind the lens of the professional images. So whilst I can say I have officially ticked this item off my list-I still honestly lust after another chance to see the lights in their fullest, most-glorious, sky-concert, show-off best. Call me Oliver Twist! The Northern Lights are on my bucket list…perhaps they will be a reality for me in 2014 – hope the super spectacular lights are out! Hi Anita! I hope you manage to see them-I’d love to see your photographs when you do! Yes-this year and next are supposes to be the strongest for the solar activity cycle (runs in 12 year cycles apparently)… Can you see them near to where you are at all? I heard that it’s MUCH colder at the same latitude transatlantic than it is in the Nordic regions due to air pressure and land mass… A lot of the people on the Nordic lights tour were actually Canadian, which surprised me!! Good to hear you saw the Aurora Borealis even though it was not at its best. There can be some really amazing light shows but it’s really hard to be at the right place at the right time. Anyway, you got to experience something many people only dream about 🙂 Let’s hope you’ll see more in the future! Hey Anna! Thanks for the comment… Yes-I certainly do feel very lucky to have been able to have ticked this one off in any capacity! Most will never see them. Have you seen them before? To see the Northern Lights is number one on my list and I’m worried about exactly what you experienced. It’s always disappointing to have a bit of a let down on something you looked forward to but better than have not seeing them at all! I think I’m going to plan my Sweden trip to be just like yours! It is still high on my bucket list. The photo looks good that you have. But I can understand not what you expected. I saw some of my buddies photos from iceland and they were amazing so I have hope they can be great. Still amazing you had the chance to do it. One day soon I hope for me as well. I am Canadian and there are places in this beautiful country of mine I have yet to see. I am working on becoming a travel writer/blogger, but I am visually impaired and not sure if I would be able to see the lights. Are they bright enough do you think? I can see lightening and the moon when it is full enough, but have never been able to see stars. Hope that helps you be able to possibly understand my question. I may not be able to see a lot of this spectacular planet, but I plan to experience it just like everyone else and hopefully provide a unique perspective.